Before you check out the answers provided below, note that this is really neat quiz and it gives amazing results. The first thing you should do is to look at the pictures, focus on each of them, and choose the one you feel most connected with. Look at the offered paths and let the serenity guide you. Once you choose the image you feel most connected with, read the corresponding numbers below! If you chose Door #1, you are a person looking for space, freedom, and ability to do things your way. You want to follow a path which is carved by yourself, with infinite routes and opportunities. In other words, you hate being constrained and limited. You are independent, rebellious, and too busy enjoying life. However, you hate confrontation and being rushed, as you want time to enjoy life to the fullest. If you chose Door #2, you are a person who wants to travel alone, to observe, to think, and take time to sort out the things running in your mind. In other words, you prefer a path which is designed for yourself only! You can see people arrive at your destination, but you desperately need your downtime first. You are unique, insightful, understanding, original, and with a specific point of view. Others can benefit from your point of view, which is your big advantage. However, the bad thing about you is that you are a loner who takes time to bond with other people. If you chose Door #3, you are an engaging person who doesn’t want to be excluded from this world. In other words, you want to participate in all sorts of things and you are more about the journey than the destination itself. Your ideal path is filled with beauty, excitement, and color. you are witty, intelligent, funny, and curious and you ask a lot of questions, engage in conversations and thirsty for knowledge. 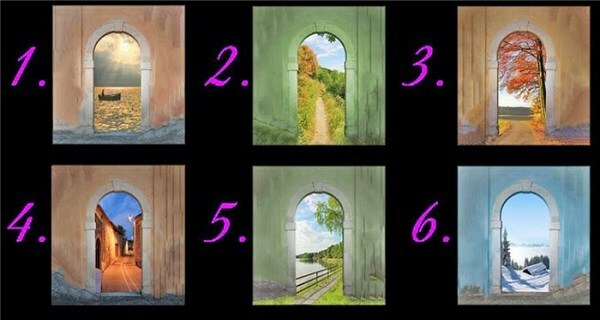 If you chose Door #4, you are drawn to the unknown and you are always moving forward in your life. You are spontaneous, adventurous and go for things without thinking about the consequences. Your ideal path is quite unpredictable and at times even scary. Even though you tend to act without thinking, it usually works for you! You are also a rule breaker who wants to get the most of your life, without over thinking and bothering with the outcome. If you chose Door#5, you are peace-seeking, down to earth, and content. Your ideal path is welcoming, clear and enjoyable. You don’t like being bothered, take things easy, and want to enjoy your trip. You understand that life is hard and simply don’t want to make it harder. However, you are also very supportive, stable, and attentive toward other people. If you chose Door#6, you are a person who appreciates solitude in all aspects of your life. In fact, you can spend a lot of time alone without feeling lonely or depressed. Therefore, your ideal path is still and quiet. However, even though you hate crowds, this doesn’t mean that you don’t like people. You want to learn more about those in your surrounding without feeling overwhelmed and you also tend to look for meaning in everything. Finally, you are deliberate in both action and though and you appreciate authentic relationships and the depth of face-to-face interaction. Let us know which door you chose in the comment section below and share your thoughts with us!